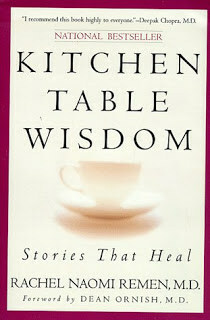 Kitchen Table Wisdom is about a Doctor, Rachel Naomi Remen. It is about her journey through life, with a life threatening illness, becoming a doctor when most doctors were men and finally realizing that people needed to be cared for not just treated. This book takes the form of short stories. She tells of her patients and their struggles to connect to the people around them. She tells of their desires to mean something to their doctors, even when the doctors treat them as a piece of business to take care of. Some of the stories felt repetitive to me, but I don’t know that she could take any of them out. Some of the ones that didn’t mean anything to me might mean the world to another reader. I loved the stories, sometimes the words between the stories felt too long because I wanted to know more about the people she was helping. I think the number one reason I liked this book, is because Dr. Remen’s how philosophy is helping patients to heal by listening to them. There have been so many times in my life where I thought the doctors saw me as a number and not as a person. It is refreshing to see someone take the opposite approach. My final verdict? I liked it. I didn’t love it. I did love it for the first half and after that it seemed repetitive to me. Try it, maybe you will love it. Thanks for the review, this one is on my to-read list. I saw that "Complications" by Atul Gawande is on your queue. I really liked that one. And I would recommend reading "Better", his second book, after you've finished the first. They complement each other nicely.